Today I decided to take the kids out to Fountain Gate to see The Simpson's show they had on ( Thanks Fleur for telling me it was on) The kids loved it. 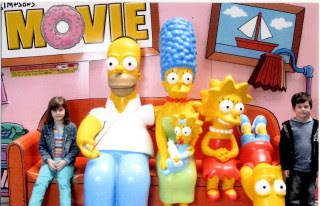 Although they did say to me after the show "that wasn't the real Homer it was a man dressed up cos he didn't talk" OMG they are growing up....lol They were doing free photos of everyone with The Family. At first Trey would sit down but he changed his mind after awhile. I took my camera only to find it wouldnt work cos the batteries were flat...gawd I hate that. So I used my phone and not sure if they turned out cos I have no idea how to get them off the phone onto the puter. Will have to read the book tomorrow....I know I am hopeless. 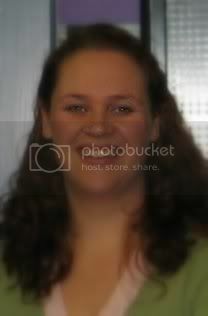 Anyway heres the pic they took.